Lindsey Graham didn't make the cut for a spot in Thursday’s Fox News-Facebook GOP prime-time debate. But that doesn’t mean the South Carolina senator, who's polling toward the bottom of the 17 Republican contenders, won’t be capturing the attention of millions while his rivals are grilled onstage by hosts Bret Baier, Megyn Kelly and Chris Wallace. “Senator Graham has an account and will be snapping,” Brittany Bramell, communications director for Graham, told International Business Times. Before, during and after the debate, Snapchat -- the popular disappearing-photo and -video app, with over 100 million daily active users -- will be curating a live feed visible to users in the U.S. Pols and their handlers can submit their own behind-the-scenes footage into the public stream. Graham’s reliance on the app to get his message out in a crowded Republican field shows how the GOP, which saw millennials vote for Barack Obama en masse in the 2008 presidential election, is embracing tech, somewhat belatedly, in part get around the networks’ time and space limitations and also to appeal to the younger voters it needs to recapture the White House. Indeed, Snapchat has quickly evolved from an app used by teens and tweens for stealth messaging into a major player in media and politics. The company has spent the last four years selling itself to various industries and now it's looking to change how campaigns work. Politicians are sharing photos and videos directly with constituents and watching their content go viral. They can also get data on voter sentiment on a range of issues. Beyond the Beltway, CEO Evan Spiegel formed early relationships with musicians, celebrities and other entertainers, and the team has continued to build on those partnerships. He’s also won over some high-profile media companies, such as the Daily Mail, Time Inc., ESPN and National Geographic. Along with maintaining their presence on social networks Facebook, Twitter and Instagram throughout the night, GOP candidates will be sending candid photos and videos through Snapchat. The app connects them to a millennial audience not often tied to their televisions but routinely on their smartphones. The GOP’s embrace of digital tech is an about-face from previous elections. Hillary Clinton announced her presidential candidacy for 2008 with a YouTube video while some candidates on the Republican side still viewed email as edgy. But now with the abundance of social media, and its proven influence on Madison Avenue, politicians from both sides are quicker to bring tech into their campaigns. Most have launched official Facebook, Twitter, Instagram, LinkedIn, YouTube and Snapchat accounts. “The senators that have the highest profile -- Rand Paul, Ted Cruz, Elizabeth Warren -- they’re newbies. You used to have to be in the Senate for years to reach that. Why are they so relevant? They’re very attentive to how audiences react and interact,” said Brian Donahue, a former Republican campaign manager and now head of digital firm CRAFT. Snapchat is the latest shiny object. Seven out of 17 Republican presidential candidates for 2016 have been early adopters. Sen. Rand Paul, R-Ky., joined in January 2014. Others, such as John Kasich and Jeb Bush, do not maintain an active personal feed but have purchased ads or publicly streamed feeds to Snapchat. Some are recent converts. Sen. Graham told the New York Times back in July that Snapchat was “too long-winded.” At the time, he had a flip phone. He’s since purchased an iPhone and created a Snapchat account. Not every candidate has signed on, however. There’s no daily content from Mike Huckabee, Ben Carson, or front-runner Donald Trump. “It’s obviously difficult to sell people on an untested platform. [Politicians] had just started to get used to spending money on Facebook,” said Vincent Harris, head of digital firm Harris Media, whose clients includes Sen. Paul. To penetrate D.C., Snapchat made two key hires that insiders say have won over politicians and policymakers. One was Google political and ad sales exec Rob Saliterman, who came aboard in May. He “is the best salesman in the political market, honestly,” Harris said. Saliterman previously worked on the communications team for the Republican National Committee and the White House. CNN national political reporter Peter Hamby joined Snapchat’s team in late April. The pair have been keeping a high profile around Washington in recent months, pitching Snapchat as the best way to reach 18 to 34-year-olds and talking about the more than 3 billion video views the app receives each day. Politicians are biting -- not only creating their own Snapchat accounts but also pouring big ad dollars into the company. Snapchat does not break out specific revenue figures, but ads are said to cost between $50,000 to $500,000, depending on views and placement, Re/code reports. Snapchat has several “live story” feeds that are accessible to viewers in specific cities. The app began with a “Los Angeles Story” and has since expanded to New York City, London and Washington. Snapchat launched the feed in D.C. on July 20 and immediately introduced new advertising options: 10-second video spots and sponsored filters. The U.S. Travel Association was one of the first to buy in. Campaigns also have bought into “stories” that Snapchat has created in regions outside Washington. For example, in mid-July, Wisconsin Gov. Scott Walker and Ohio Gov. John Kasich (both of whom secured slots on Thursday’s debate) purchased 10-second video ad spots within a curated, politically focused “live story” accessible to Snapchat users in Iowa, New Hampshire, Nevada and South Carolina. 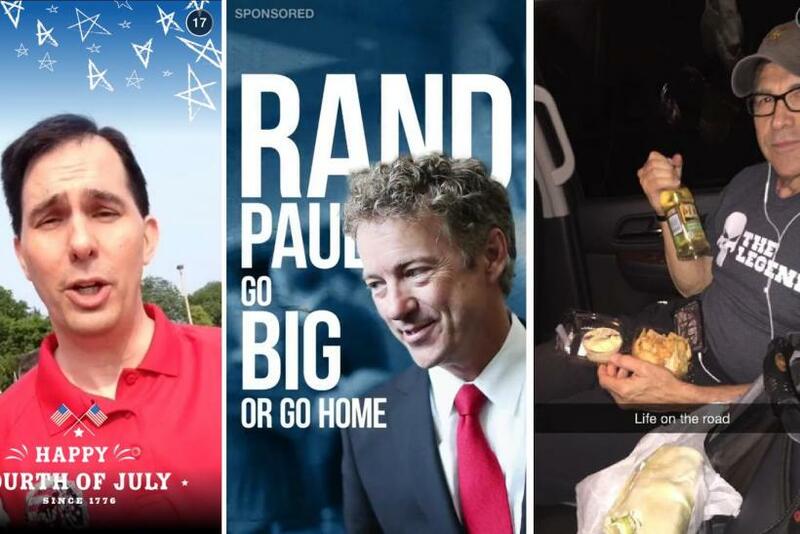 Last week, Sen. Paul’s campaign created three 10-second video ads and placed them within Snapchat’s Discover channel -- a network of daily content from 11 media partners in the U.S. The ads were also targeted to users in the four early states. The candidates seem impressed by the results. While staffers declined to disclose viewership numbers, Kasich’s super PAC, “New Day for America,” has paid for a 10-second Snapchat within Thursday’s GOP feed, accessible to Ohio viewers. As production assistants direct the cameras to the contenders, they’ll be dozens of handlers and other operatives behind the scenes feeding content to Snapchat. “I think the most interesting point that was made to me [by Snapchat] was thinking about these stories. That when there’s an event in a particular location you’re able to view that nearly in real-time and get so many different perspectives,” Donahue said. “The vision is that people will choose to Snapchat if they want to see a news story, rather than going to local news,” he continued. Not every active Snapchat user is a registered voter or even could be for this cycle. 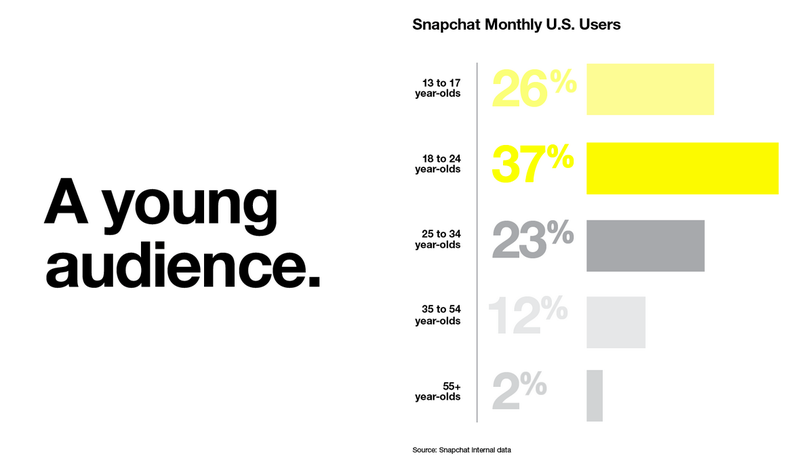 About 26 percent are 13 to 17 years old, Snapchat reports. But that group, as well as the other engaged users, has clearly won the interest of politicians as they share -- for free -- the candidates’ messages on their own social media accounts. “These are the off-the-grid voters,” Harris said. As to the young Snapchat users, many of them will be enfranchised in the next cycle. Twitter was equally slow to gain a foothold in the political dialog. “You watched Twitter kind of take off and people say, ‘Yeah, you’re on Twitter? Good for you.’ And then the next time, they’re asking you for help,’” said Amos Snead, a former Capitol Hill communications staffer and now head of public affairs firm Bryant Row and D.C.-based networking company FamousDC.com. As for Snapchat, its emergence as a media and political mainstay might eventually justify its $16 billion valuation. GOP candidates are hoping it’s worth at least a fraction of that to their presidential aspirations.